Any duration or genre is permitted. OFFoff welcomes fiction, animation, documentary,... as long as the work is of experimental nature. We look for works that are challenging or renewing in terms of form and content. Participants have to be younger than 35 years old. A short bio and list of screenings. exhibitions or other in which the specific workls) has/ have been screened. Technical information: Country, production year, length, color/b&w, screening format. Link to your vimeo/youtube account with your work(s) of choice, password and login. 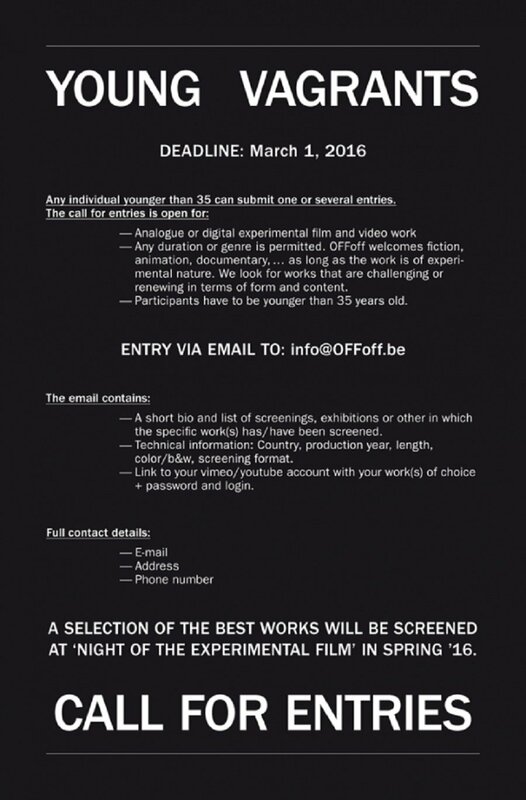 A selection of the best works will be screened at ‘Night of the experimental film' in Spring '16.